A chat with the world's most sought after bespoke tailors. Recently while traveling we've noticed an interesting trend toward bespoke clothing and accessories. It seems more and more young brands are looking to Old World methods of construction and production to create products of a higher caliber—handcrafted by skilled people, and made to last. While bespoke isn't new, this resurgence for high quality, custom made goods comes at a time when the market places is saturated with throw-away trends. It isn't surprising to read that despite the global economic slowdown, bespoke tailors are actually showing steady gains year over year. In fact, bespoke has become so popular with urban, fashion forward men trying to shed their mass market uniform, that bespoke shops seem to be popping up all over big cities like New York and Tokyo in order to fill this need in the market place. While we love to see brands embracing bespoke, there is no one who knows it better than the tailors, cutters, and sales people from the famous Savile Row. We thought it would be great to get in touch with these masters of style to talk bespoke, current fashion trends, and the common fitting issues most of us rookies fall pray to when we buy off-the-rack. We reached out to Angus Cundey, Owner of Henry Poole & Co; Tristan Thorne, Under Cutter and European Traveling Representative at Dege & Skinner; Roubi L'Roubi, Creative Director at Huntsman; John Blanco, General Manager of Bespoke and Made-to-Measure at Gieves & Hawkes; and Stuart Lamprell, Head Cutter at Hardy Amies. These are the most knowledgeable, and sought after people in the world of tailoring, and here's what they had to say. Q. Can you tell our readers a bit about your house, the cut you're most known for, and what sets your suits apart? "Henry Poole and Co. does not have a rigid house style, as for over 150 years, we have made bespoke garments for clients from all over the world with differing figures and styling requests. Our most popular town suit is with a two button front, side slits, natural shoulders, semi firm body canvas giving shape in the waist. One pleat trousers with plain bottoms. For less formal Country suits and sports jackets, we make a 3 button front, slanted pockets with flaps, ticket pocket outside with flap, centre slit. Trousers with cuffs (turn ups). One third of our town suits still include waistcoats (vests)." 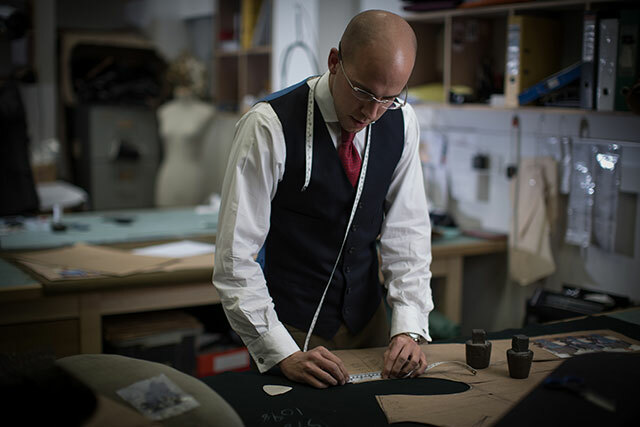 "Everything we make is bespoke and cut on the premises at 10 Savile Row. 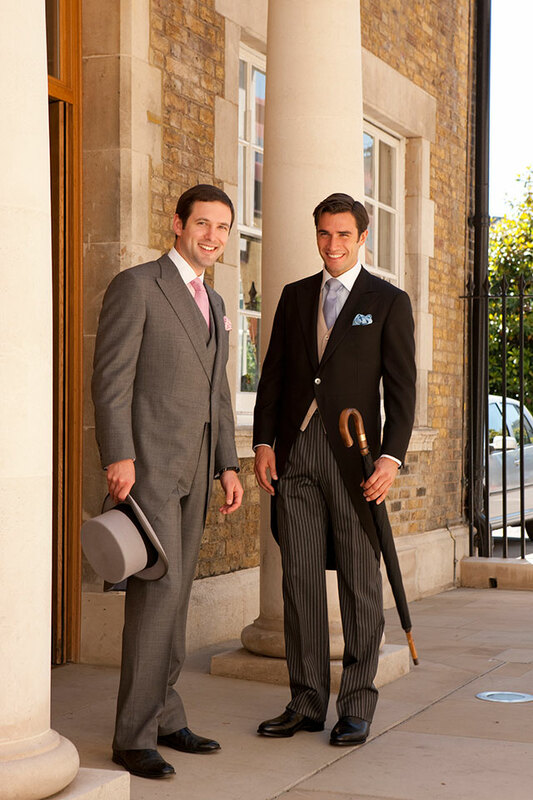 Even our range of accessories – ties, dressing gowns, caps, umbrellas – are ‘Made in Britain’. Our civilian ‘house’ silhouette best suits a well-formed chest, is nipped in at the waist and has a small skirt, with hand-sewn shoulders and sleeves. We use ‘Melton’ to line pocket flaps, thereby ensuring that they maintain their shape and continue to sculpt around the wearer’s body, without deterioration over time. For military, it’s high armholes, with a natural, unpadded shoulder, again to prevent deterioration over time. Huntsman: A Huntsman suit has a unique house style with individual line and shape. The shoulder is sharper with the armhole slightly higher than usual, the shape very waisted and the cut of the coat a little longer and more natural in appearance than others; with the emphasis placed upon a clean line combined with their distinctive one button fastening (they were the first to do this back in the 1940s)." 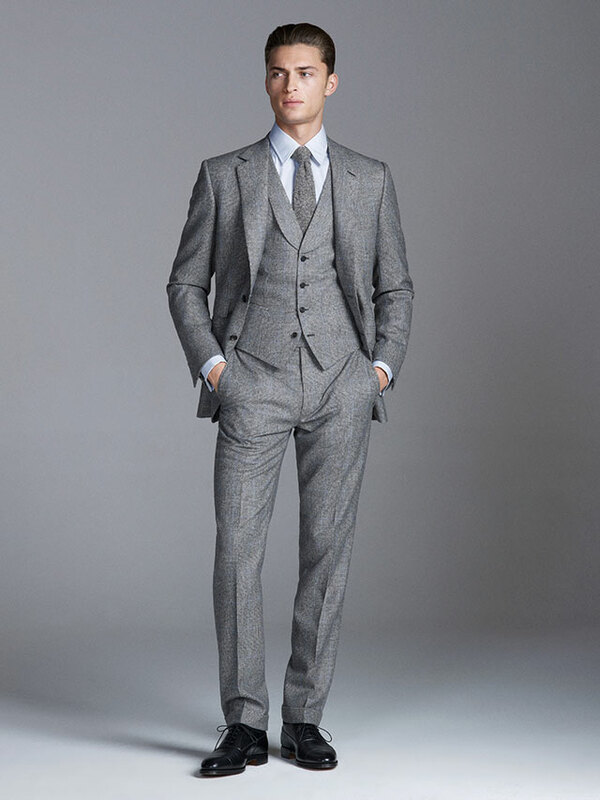 "A Huntsman suit has a unique house style with individual line and shape. The shoulder is sharper with the armhole slightly higher than usual, the shape very waisted and the cut of the coat a little longer and more natural in appearance than others; with the emphasis placed upon a clean line combined with their distinctive one button fastening (they were the first to do this back in the 1940's). As a bespoke tailor we offer any cut the customer would like, we offer advice throughout the process but ultimately the customer lets us know what he or she would like. We cut morning suits, double breasted suits, tweed and sporting wear for a variety of different customers who often want slightly different cuts. We generally find the younger the customer they look at a slimmer cut. As they get older the look at more traditional fuller cuts. Over the years we have also found that the older gentleman will be the ones more often than not to order double breasted however as there has been a recent resurgence with the younger customers wanting to stand and thus the double breasted orders have increased." "A contemporary fitted style that compliments most figures. Three “young” cutters in our bespoke team who have an amazing eye for what is contemporary without going to extreme. Our bespoke garments are all made by hand in the old traditional way—using skills that date back centuries. No short cuts here. If you were to look at the interlinings inside of one of our jackets you will see all the canvases shaped by hand stitches. To do this, is very time consuming procedure but reflected in the final product and carefully sculptured shapes." "At Hardy Amies we work with our clients to find a style that most befits their taste, body and lifestyle so we don’t have a house fit per say however we have a tendency towards a cleaner, more English style – pinched waist, small skirt and clean through the chest." Q. We feel that there is a resurgence in the youth market for handmade, quality crafted clothing, do you feel that bespoke is being adopted by this generation of fashion conscious consumers? "It is encouraging that many young men today wish to dress formally for their wedding and either hire or even bespoke order, morning coats or dress suits (white tie). Ultimately this is making younger men more fashion conscious and more likely to wear a smart suit to the office." "We’re seeing a heightened interest and desire amongst a younger generation of men living in the urban environment for well-made, traditionally styled suits and jackets, ‘investment pieces’ rather than mass high-street purchasing of poor quality clothing that doesn’t last. That said, we recognize that while a lot of younger people aspire to wear bespoke, they have yet to be able to afford it and we look forward to the time when they can purchase from us." "Interest in bespoke and well-made clothing is immense at present. People are interested in owning luxury goods but know that their bespoke suit is true luxury, yet discreet at the same time too. Customers like to know where their suit has come from and that it was made exclusively for them and is truly unique. The younger generation has more access to information about luxury goods these days especially when we are talking about tailoring. Whereas before Savile Row was a very intimidating place and thus you would not come into a store unless you could definitely afford what they were selling. Nowadays with the growth of London Collections: Men and the fact that the house have opened their doors more and become open to self marketing more young people have been fascinated and also respect the art of tailoring more. Men, be that young or old, are very different when shopping than their female counterparts, they tend to spend more money on one off occasions which makes bespoke suiting their perfect purchase and why we have seen growth in this area." "There is a trend for well to do individuals “discovering” bespoke tailoring and the internet plays a major part here. These individuals once they approach a house such as are often astounded by the possibilities that bespoke offers." "Bespoke has the benefit of being truly original, I think this appeals to a younger demographic." Q. Have you noticed any trends emerging from your younger, fashionable clientele? What are they looking for in terms of cut, color, and styling? "Younger men seem to favor slightly shorter suit coats than we’ve seen in the past. Cloth choice – weight, composition, color and design is where we see personal variation to the greatest extent, with most customers becoming more adventurous as they order more bespoke items. Interest in having very specific bespoke pieces made for the ‘ultimate gentleman’s wardrobe’—a classic navy blazer, silk dressing gown. This year, we’ve experienced increased demand for car coats and overcoats made from classic English cloth, such as Fox Brothers in Somerset." "Huntsman has never been about trends, it focus has always been on style. Customers realize this and choose to invest in suits that will give them confidence and grace rather than following the fast-paced moments in fashion. However there will always be those that are lucky enough to have a few suits in their wardrobe and then have the opportunity to be a bit more experimental. 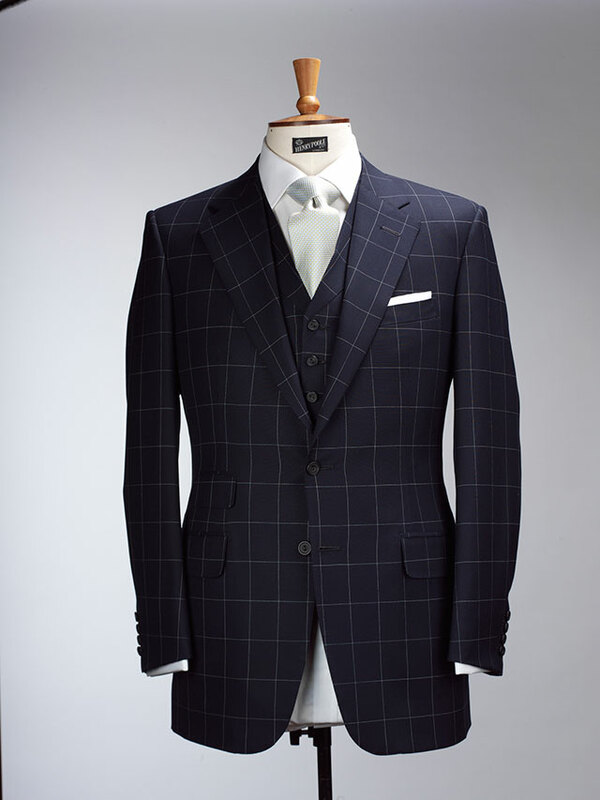 Double breasted suits have seen a rise as has the demand for bright Huntsman tweeds. Especially considering they can only be bought at Huntsman and are truly one-off cloths." "Young men in their twenties today are very conscious of fashion, but often when we meet them they have already explored the big brands in ready-made clothing and often they have been less than happy with what they bought. They are also at a stage in their lives where they feel they want to develop their own style and these is where Bespoke comes in—offering advice from fabrics, to garments specifically suited for an occasion. Primarily is comfort together with a specific look that compliments the figure and the image they would like to portray. There is a tendency to get away from the basic colors that everyone has been wearing for the last few years and exploring traditional designs in pattern or textured fabrics. These individuals are exploring wearing lighter colors and browns in various shades." "It differs with every client, of course, but we have seen a rise in more interesting patterns being chosen. A Prince of Wales check with a brighter thread woven through for example, and usually a slimmer fit." Q. 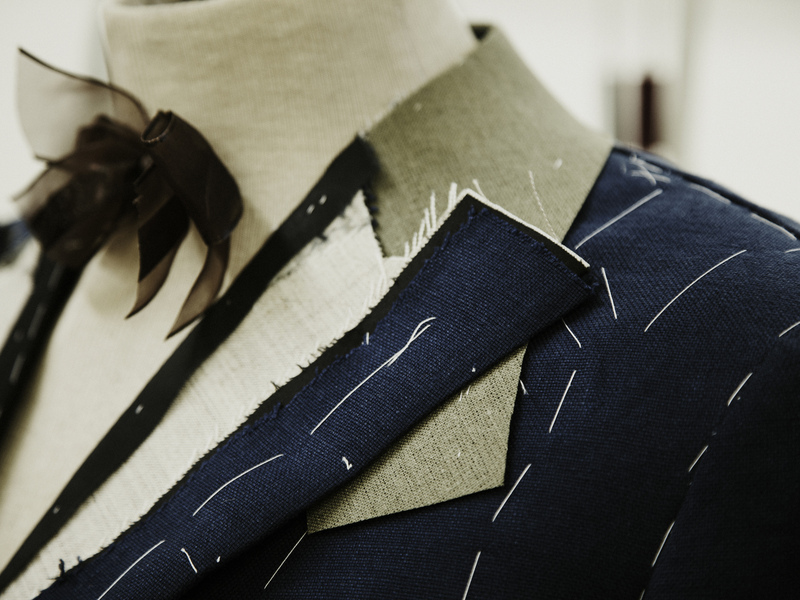 Can you share any inside tips on fitting, fabrics, or styling when buying bespoke? 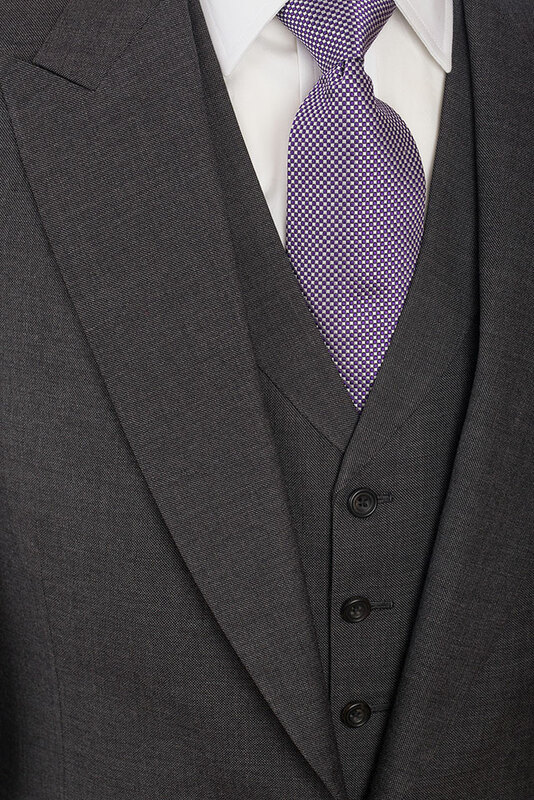 "At Pooles, we have over 5,000 patterns of worsted wool fabrics from Yorkshire, flannel from West of England and Cheviot, Shetland and Harris tweeds, all for our bespoke clients to choose from together with silks and velvets for evening wear." "If you’ve ever worn a piece of bespoke tailoring, it’s easy to understand why buying on the high street no longer appeals quite so much. The phrase ‘fits like a glove’ springs to mind, with comfort and elegance carefully balanced for the wearer’s pleasure. The fit is unique to the individual’s body, cut from their own unique pattern by their personal Bespoke Cutter, with the ability to choose everything from the cloth, to the style. Shirt customers can have a sleeve made to fit a specific watch for instance, or a hidden pocket to safely and discretely carry diamonds, as in the case of one of our British customers." "Visit the store before your appointment, get comfortable in the store and interact with the tailors and salesman. Despite what people think they are not scary they are as interested in bespoke clothing as the customer and sole job is to encourage those in purchasing hand-made tailored items. They have a wealth of knowledge and can see within 10 seconds of a customer walking in the store what fit would be best for them. Also, always wear smart shoes or the shoes you would wear with your suit to the fitting so they can get the fall of the trouser to the exact fit as you would like." "If you are going to have a bespoke garment made ensure that your tailor goes to the trouble of finding out a little about your life style, only then can he advice on fitting, fabric or styling." Q. What's the worst fashion trend you see on the market? "Anoraks worn to work in the City." "Fashion trends, inspired by the catwalk and worn on the high street can lead to wearing unflattering clothes, which accentuate the least favourable parts of one’s body. We wouldn’t want to pick one in particular." "Ill-fitting clothes, and trousers hanging off young men’s bottoms." "The worst trend is the lack of quality – Design alone does not make up for lack of quality." "It is not about whether is is a ‘bad trend’ but how the consumer wears it." Q. It's not uncommon to see poorly fitting off-the-rack suits where shoulders don't fit, jackets are too tight, or sleeves are way too long. Which fit issues you notice most on the streets? "Sleeve lengths too long, particularly seen on some prominent members of Parliament." "The current trend in London is to have suits that are simply too small for the wearer – both the overall length and in the chest area, sometimes making it difficult to do up the suit jacket! Most often we notice very tight sleeves with large armholes to cater for all manner of sizes. 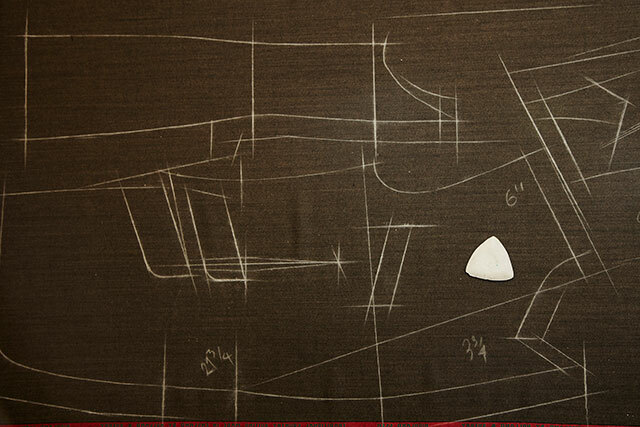 When making bespoke, the pattern is cut for the individual and them alone, allowing the fit to be uniquely fitted for the individual’s body-shape, to flatter their physique as well as provide the ultimate comfort and elegance." "All of the above, it is rare that anyone is perfectly fitted to an off the rack suit, so for only a little bit extra we would encourage those to get their ready to wear suits slightly tailored. There are so many fantastic places that can slightly alter a suit and it is very inexpensive." "There are many to mention, but the worst is the individual who just lacks style. Fitting is about perception but lack of style reflects lack of imagination." "Knowing what size to wear is a common downfall in suit-wearers." Q. What is the one big mistake men make when they buying a suit? "With our expert sales staff and cutters, I trust that none of our customs regret their final choice of cloth and the comfort of their bespoke suit." "Buying a suit that is too small and then failing to do the necessary alterations to make it fit better. The shoulders fit but the rest of the suit hangs off the body, rather than show it off in its best light." 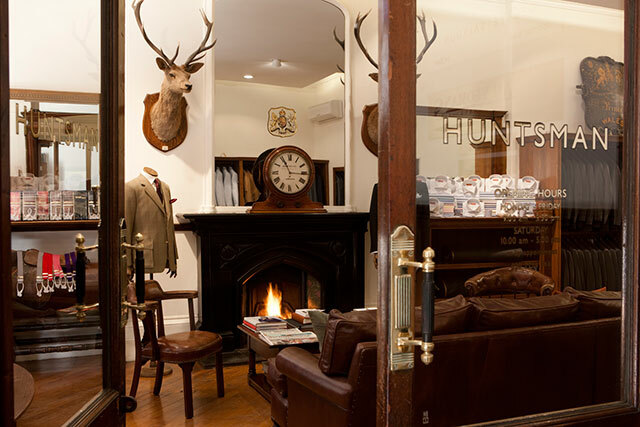 "There are no mistakes made when shopping at Huntsman as we talk through every little detail however what we see when men are buying ready to wear suits is they do so quickly and without thought. They don’t like shopping and want to be in and out in minutes thus not properly trying on garments and buying ill-fitting suits. It’s just men being men." "Not to get professional advice." "They don’t think about how many times they’re going to wear it, don’t consider what they already have in their wardrobes. You can wear a bespoke suit throughout your life if you take care of it so it is usually beneficial to go for a simpler fabric and cut at first." Q. Have you dressed any young (maybe famous) clientele recently that our readers might connect with? "A golden rule of Savile Row is that we never divulge the names of living customers." "Proud holders of three Royal Warrants for tailoring, we have dressed various members of the Royal household, including TRH Prince William and Prince Harry, whose uniforms we made as they were commissioned in the Blues & Royals. The official portrait now hangs in the National Portrait Gallery, with special permission granted to allow us to display a copy in the shop at 10 Savile Row. Recently we’ve seen military pieces come up at auction that had been previously worn by pop legend, Michael Jackson and Versace had just received items from us when he met his untimely death. In the main however, we don’t disclose customer names." "We do not comment on current clients, however we have dressed many stars or stage and screen. We currently have our archives on show past customers include Gregory Peck, Peter Sellers, Hubert de Givenchy and Katherine Hepburn to name just a few. You may have also seen Huntsman clothes in Downton Abbey, Tinker, Tailor, Soldier, Spy and on Mark Strong in Body of Lies." "Yes – Lawrence Clarke Olympic sprint hurdler – someone who has style and knows how to wear clothing." "A man will rarely reveal the name of his tailor and we like to honour this for our clients." Q. Okay we kind of knew you weren't going to divulged your famous clientele, how about telling us something unique about your house? "Despite a possible old fashioned image we may have, one third of our staff are under 30 including 5 apprentices in the workshop." "We are the only bespoke tailoring house on Savile Row to have a bespoke shirt-cutting department permanently located in the shop. Customers can walk in and see Mr Robert Whittaker and his apprentice, Tom Bradbury at work in the shop. In our archive at number 10 Savile Row, we safely store the ceremonial uniforms worn on State occasions, such as those worn by the Officers of The Queen’s Bodyguard The Yeomen of the Guard at the State Opening of Parliament." "Upon entering the shop, you are greeted by our two iconic stags’ heads, dating back to the 1920's and left behind by a customer on his way to lunch. They preside over a comfortable sofa and coffee table, perfect for perusing cloth bunches or catching up on the day’s news whilst awaiting a fitting. This is information that can be found on the site however we have also just renovated the inside of the store extending the shopping and collection areas, we have also set up a temporary archive for customers to peruse and we have also added a few more stag heads. So please pop by any time you are in the area." "No 1 Savile Row is the Cathedral of tailoring, if you immerse yourself in what it has to offer, it is guaranteed to affect you." "It is a friendly place where one can feel at home in his surroundings." So what have we learned by talking to these masters of fit? Choose quality over quantity, invest in pieces that are classic and well-made, and don't fall prey to fleeting trends and you'll always look like a million bucks. After all, style is about individuality, and what's more individual than a garment that's been made for you?